Professor Charles Friedman is Chair of the Department of Learning Health Sciences at the University of Michigan Medical School. He is the former Deputy National Coordinator and Chief Scientific Officer, Office of the National Coordinator for Health IT in the U.S. Department of Health and Human Services. Professor Friedman first became interested in the concept of Learning Health Systems in 2009, whilst working at the Office of the National Coordinator for Health IT, where he became aware of the work of the Institute of Medicine into the field. US Government policies such as the HITECH act and Meaningful Use have been a necessary foundation but not a complete solution to developing the learning health system. Professor Friedman has continued to explore the science of the Learning Health System at The University of Michigan. He has recently championed an effort to identify the challenges to developing an LHS. The National Science Foundation helped organise a workshop to identify scientific problems to developing a high functioning LHS. This identified 106 questions to be addressed in the development of learning health systems. This work highlights that current understanding and infrastructure are inadequate for an effective system and provides direction for further work. Funding for the technical elements of the learning health system is necessary but not sufficient. Big Data research has been relatively well funded but there is a need to recognise that the Learning Health System is more than just “Big Data” and that this only represents perhaps only a third of what is needed. The other two thirds include completing the cycle, learning lessons, implementing change and scaling the system. The Learning Health System can be viewed as a fractal, an idea that could be implemented in the same way at any level of scale – global/national/state/institutional. Clinical research is increasingly becoming an international collaboration. A significant challenge to the learning health system is one of scaling this cycle. The red/efferent side becomes an enormous interdisciplinary problem incorporating behavioural psychology, communication science, implementation science, behavioural economics, policy science and organisational theory. If we continue to rely on journal articles as the means of dissemination, there will continue to be a 10, 15, 17 year latency before learning makes its way into practice. We need to find a way to interpret findings and codify knowledge. Automated systems could codify knowledge with machine executable guidelines and representations of information. These are potential methods that could be used to translate knowledge back into the efferent aspect of the cycle. 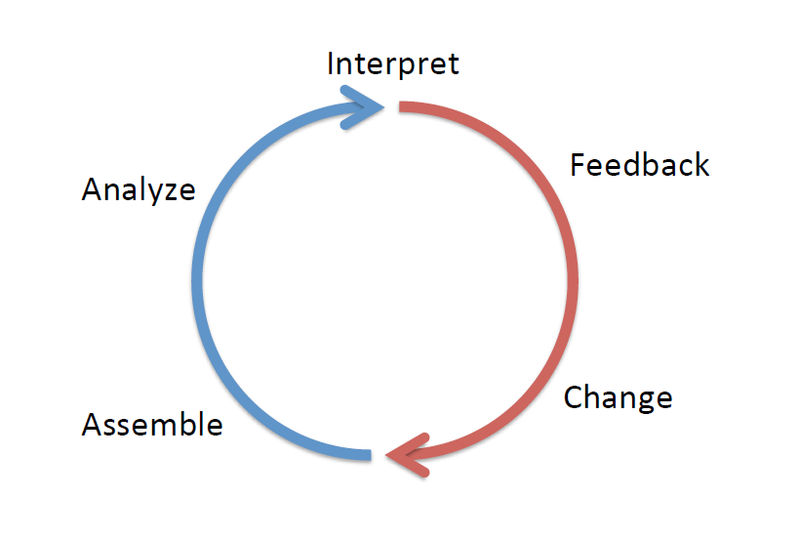 However there needs to be research into behaviour change to create efficient platforms to complete this learning cycle. Currently, no part of the cycle is working as well as it could. Ultimately, a system whereby treatment decisions are based upon data from “patients like me”, where clinicians could search a database to identify similar patients, their treatments and outcomes, to inform choice for the patient would be the key use case to empower the consumer. However this will pose the “fuzzy proposition” of how similar patients within this ‘dynamic cohort’ would need to be to draw valid conclusions. No other patient is truly like me. • This will be the institutional stage. The knowledge cloud will not provide clear answers. Doctors will become organisers and question askers. They will provide the scaffold for patients and carers. IT systems are unlikely to replace this role in the foreseeable future.